Following a recent family experience with dementia, Tim’s son Jack and two of his friends took part in the Youth and Philanthropy Initiative. He was proud and delighted when his son’s team won the competition for their presentation supporting The Living Well Project. Inspired by Jack and his friends’ success and passionate desire to do something to help sufferers, he decided he too wanted to do his bit to help this small and relatively unknown charity. It has long been an ambition of Tim’s to climb Kilimanjaro so he decided to take the plunge and booked the trip, with the intention of raising funds for The Living Well Project along the way. He sets off in August on the 70 km trek, summiting at over 19,000 ft, and it will take him 8 days to complete. Not to be left out, his colleagues in the Scotland Business Banking Team of HSBC are planning to join in to support the fundraising and have taken on the challenge of “Climbing Kili in 12 Hours” between them. They are setting up treadmills in their offices in Queens Road on 30th May and will take turns climbing until they reach the “summit”. The Living Well Project is something very close to Tim’s heart, having seen at first hand the effects and impact that dementia and other related illnesses have on those living with dementia and their families. While it is a devastating fact that many attending struggle to remember having ever been at the Living Well Cafes, it is obvious that while they are there “in the moment”, they are having a wonderful time with the volunteers and the activities laid on for them. With your generous support, Tim hopes that The Living Well Project can continue this invaluable service to the local community and ensure many more days of happiness for those affected. Helen’s mum has been living with dementia for many years and she knows only too well the challenges her mum faces with confusion, frustration and upset in plentiful supply. Helen takes her mum and daughter to the Living Well Cafes every week and can see at first hand how much her mum enjoys singing, dancing, playing games and chatting to other people – all with a big smile on her face. In gratitude, Helen is running the Baker Hughes 10k on Sunday 5 May and all sponsorship raised will be in aid of the Living Well Cafes. On Tuesday 18th September we had an unexpected visit to the café from Mark McDonald MSP. It was great to see him as he chatted with café users and volunteers, he even managed to take to the floor and have a dance with Linda our café coordinator. He couldn’t resist a game of Boccia but had the experts on hand to keep him right! We very much appreciate his ongoing support to the project. On Monday 17 September Kirsty Blackman MP visited the project to meet with staff and volunteers from the Living Well Befriending Service and the Living Well Café. She enjoyed a short presentation and was very interested in both services. We are grateful to Kirsty for taking time out of her very busy schedule to hear our story and are appreciate her offer of support in the future. 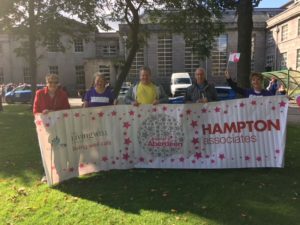 The day dawned, the sun shone and we joined thousands of volunteers in the Celebrate Aberdeen Parade down Union Street. Thank you to the volunteers who were able to join the Living Well Cafe team. We danced our way down Union Street singing some of our cafe songs though got a bit drowned out by the thumping drums behind us! Our enthusiasm was undeterred and we shook our tambourines and waved our flags to those watching. 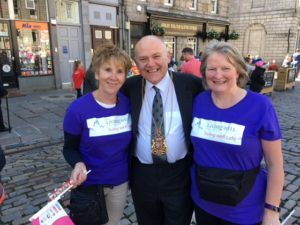 When we got to the Castlegate who was there to welcome us but the Lord Provost himself, Barney Crockett. A happy morning with a real sense of celebration of what Aberdeen has to offer. 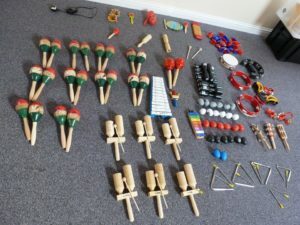 We are delighted to have received a grant from the ASDA Community Fund for over £600 towards musical instruments for our cafés. 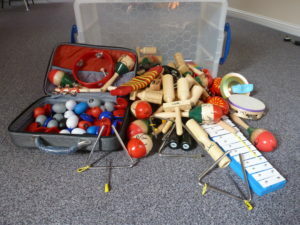 We have now bought a wide variety of percussion instruments which have proved very popular at our cafés. We are sad to be losing Jo Mugglestone from the staff of the Living Well Project. Jo first started as a volunteer with the Cafes as they began, and then became a Cafe Coordinator as we saw the work progress and develop. Her cheery, commitment and interest in everyone was a real asset to the Cafes. We wish her well as she takes more time for herself and her family, and we pray God’s rich blessing upon her. We are delighted to have received funding from many individuals and groups, and TSB Bucksburn have once again named the Living Well Project their Charity of the Year.